Not having the culinary skills to cook the shortbread biscuits at home very easy with just flour, sugar, margarine and eggs. The combination of such simple ingredients, even in inexperienced hands, it turns out delicious homemade cakes, which is not ashamed to serve to tea. To prepare the cookie dough, take a bowl, not an enamel. Stir in it one egg with a glass of sugar. Reheat on the stove or in the microwave 200 g of margarine to a temperature of fresh milk. To combine the melted margarine with the sugar-egg mixture. Mix everything carefully. To extinguish in a glass of soda with lemon juice. When it stops foaming, pour into batter, add vanilla and stir again. Now add the flour. Depending on its stickiness, the number increases. Should get a homogeneous dough, not sticky hands that you can roll out with a rolling pin. 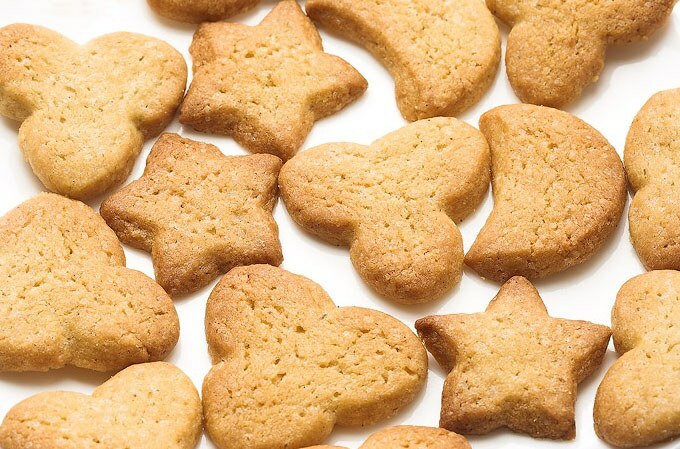 Sprinkle the table with flour and make dough of a thickness of not more than 0.5 cm cookie Cutter to cut out stars, hearts, crescents and other figures, put them on a greased baking sheet and place in oven. Once the homemade cookies will be ready, it has to cool and sprinkle with icing sugar. Now you can call guests to the table and proceed to the tea party. 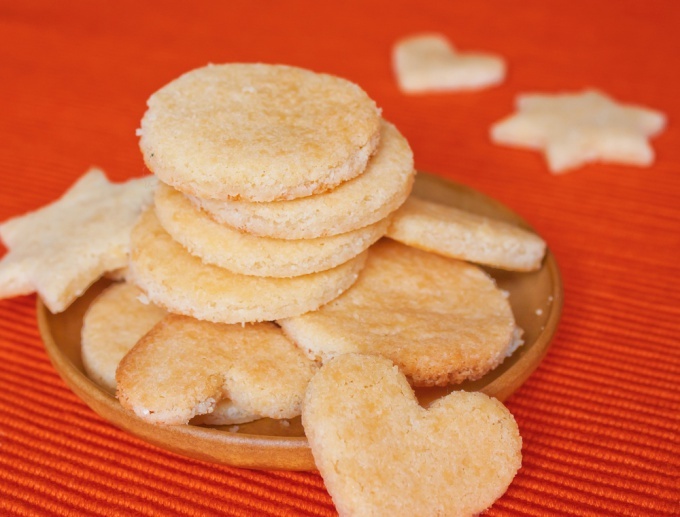 Shortbread biscuits - treat, which delighted not only children but also many adults. Cookie dough differs from other varieties of cookies for its pleasant crispness and delicate flavor. Its calorie content is related to the fact that according to the recipe it always contains a lot of sugar, eggs and fat. Now this is a treat everyone can afford, but shortbread biscuitshomemade recipes will stay fresh and crisp for a long time. There are millions of recipes for this cookie, but one thing unites them - the proportions of products must always be perfect. One hour before cooking cookies, remove from the fridge margarine. Leave it at room temperature to become slightly soft. Pre-sift the flour into the sieve one or more times and put it in a deep bowl in which you will prepare the dough for cookies. After that, put melted margarine and mix well with the flour to obtain a fatty grits. Do not forget to observe the proportion. Mix it four ounces of margarine and four cups of flour is very important. Now take another container and mix in it the eggs, sugar, starch, salt and soda. Beat it with a mixer for five to ten minutes. Then connect both parts and mix. Let's see if the dough is turned out watery, then add a few teaspoons of flour. After that the dough be sure to put on twenty to thirty minutes in the refrigerator or freezer. After the time remove the dough from the refrigerator. Divide it into five or six parts. Then each piece roll out with a thickness of not more than three or four millimeters. After that, take shaped cookie cutters and help cut out cookies. If you do not have such molds, take advantage of ordinary glass or of glass with thin edges. Then your cookies will turn out round. Pre-whisk the sugar with several proteins and brush over the biscuits. On top lightly sprinkle it with sugar or powdered sugar. Grease the prepared baking pan with sunflower oil and spread it on the cookies. Now it is completely ready to go in the oven. Bake the cookies at a temperature of one hundred and eighty degrees Celsius for ten to fifteen minutes. Biscuits turns out very tasty, crumbly and just melts in your mouth. For the beauty of the biscuit can stick together in pairs with jam, cream or jam. Before you remove the dough in the fridge, it can be divided into two parts and add one of them cocoa. Then you get two different kinds of cookies. Shortbread goes well with tea and coffee, cocoa and juices. To prepare this delicacy is very simple, it does not require any special culinary skills and it is always consistently delicious. There are many options for making biscuits, here are some of them. - powdered sugar 2 tbsp. Mash the yolks with the sugar, add the softened butter or margarine, flour, vanilla. Divide the dough into small kolobochki and roll them on a flat surface, dusted with flour. Using molds for cookies cut out shapes and put them on a dry baking sheet. Bake cookies in a preheated 200oC oven for 15-20 minutes until it turned Golden brown. Ready cookies dusted with powder sugar, if desired, you can add a bit of vanilla. Pre-softened butter or margarine RUB with sugar, in the mixture pour in the cognac. The flour very carefully and mix it with soda. Quickly knead the dough. It is not plastic and is pretty solid. Sprinkle work surface with flour. Separate from the dough small balls, roll them thick about 1 cm, then cut biscuit and pastry molds. 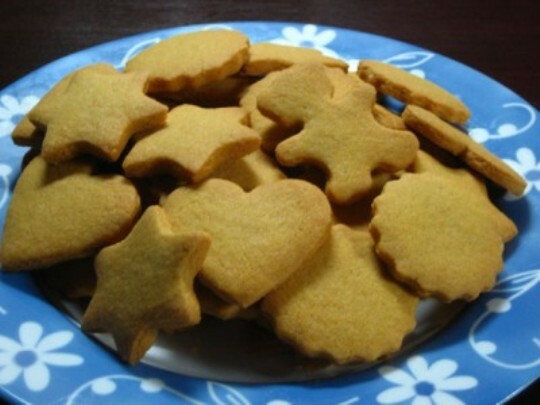 Cover the baking pan with baking paper and bake the cookies in a preheated 220оС the oven for 5-10 minutes. - semolina - 50 g.
Mix in a deep dish of dry flour, sugar and semolina. With the mixture, grind to a homogeneous mass of softened margarine and knead tight dough. Make the dough into a ball and flatten it into a pancake is thinner than 1 cm Cover the baking pan with baking paper, and bake the layer at a temperature of 200-220оС in preheated oven until Golden brown. Hot Plast cut into pieces and cool. Another option for baking this cookie in a microwave oven. In this case, cover the paper plate, suitable in size to the microwave, and bake the biscuits on high for 3-5 minutes, depending on thickness. - vanilla - 1 pinch. Boil hard-boiled egg. For this recipe you will need only the yolk. Wipe it through a sieve and thoroughly with sugar. Add the flour, butter, nuts and knead the dough. Make the dough small rolls and cut them in 2-3 places on the one hand, to make "branches", similar to deer antlers, and slightly bend them. Bake "horns" in a preheated 180 ° C oven for 15 minutes. The cookies sprinkle sugar powder, mixed with vanilla, and let cool.